A wacky, and perhaps ever-so-slightly gruesome, take on the French Revolution where you win by getting "a head". 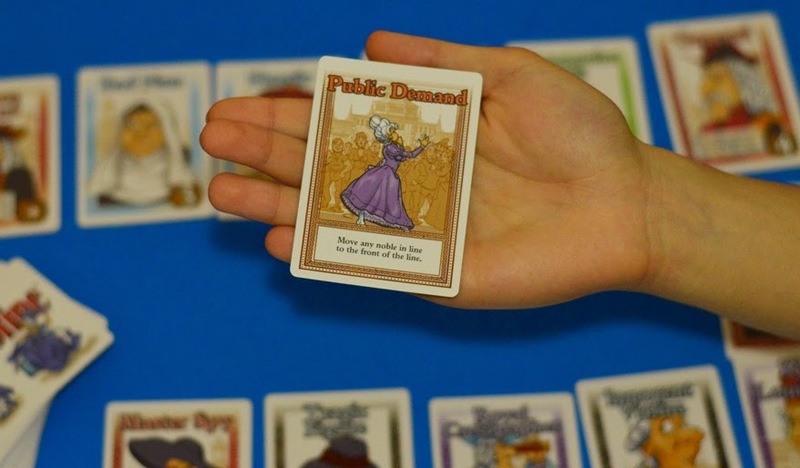 Puntastic: self-proclaimed revolutionary card game where you win by getting a head. NOTE/WARNING: This is not a game for those who take offence to "cartoon violence" or the notion of actually guillotining people. On one view, it could be suggested that Guillotine's designers were merely trying to portray an actual moment in history and present it in a light-hearted and digestible manner that would spark interest in that time period. However, putting myself in the position of someone who might take offence to Guillotine, if I did know someone who was executed in that fashion or killed in a similar way, I would probably refuse to play a game that thrived upon a parody of that form of violence. The bottom line is that we do not really understand how other people feel until the event in question happens to us or until we are affected by it (much in the same way as we don't understand how cancer victims and their families feel until it actually happens to us or those we love). In that context, I understand, respect and abstain from criticising people who object to games such as Guillotine. I also freely admit that this probably isn't the best game to play in the above context; but that being said, that doesn't make this a bad game per se in a moral sense. I still hold the view that this game can be fun and is a far cry from being anything intended to be offensive, provided that you and your group aren't sensitive to the above issues. Time to play: 30 minutes, possibly less if you choose to shorten the rounds or gameplay. Price Range (AUD): Approx $20 to $50. I would say that even $20 is pushing it. Availability: Seems to be widely available online at the time of writing. Surviving the test of time, it has been around for a bit. Guillotine is an entertaining and quick filler. Players are rival executioners vying to accrue the most noble heads in the French Revolution (though this statement is slightly misleading as it is not the number of heads that let you win but the total number of points - heads are not equally scored). This is achieved by playing certain action cards (some more powerful than others) to manipulate the order of the line or to affect your opponents. Gameplay is inherently simple and the artwork on the cards is quite nice and classy in the Napoleonic sense. The action cards are also quite interesting, letting you perform various hilarious actions to capture as many heads as possible. What strikes me about this game is the truly vast array of characters on show in the guillotine line. For example, to give you a taste of the categories: there are nobles popular amongst the people such as the Martyr, Innocent Victim or the Hero of the People (also called the gray cards - if you kill them you lose points); Religious figures like the Bad Nun, Heretic, Archbishop, Cardinal (which all give points); Combo cards such as the Palace Guard (each guard is worth the number of points equal to the number of PG's you have) or the Tragic Figure (worth -1 point for every gray card you have); Important people or VIPs such as the Baron, Governor, Colonel, King Louis XIV (which all give points); then there are all these random characters put in just for humour's sake such as the Unpopular Judge, Tax Collector, Land Lord, Royal Cartographer and even the "Piss Boy". The main downside of this game is this: it is perhaps a bit too simple - not that that is a completely bad thing. But because its gameplay is almost too basic, Guillotine's replayability is certainly an issue because the game can get a little stale if you are looking for something more. There is also very little strategy involved as it entirely depends on the cards you get. Add to that the fact that some action cards are more powerful and imbalanced than others (eg. there is a card that effectively lets you collect any noble in the line you want by moving them to the front of the queue). However, Guillotine is an interesting and entertaining game that rightfully deserves its plaudits (most notably being a 1998 Origins Award Winner for Best Traditional Card Game). A substantial chunk of the score I have awarded for Guillotine comes from its theme and colourful diversity of characters on offer for the purposes of humour. I have already mentioned at the start of this review the potential sensitivities surrounding this game in terms of its cartoon violence, and will not repeat it - of course that is something to consider as well before purchasing this game, but I can't imagine that most people would have a problem with this game. Idea of collecting heads isn't the best - and may cause offence to those who don't like the graphic idea of beheading people (but it's very rare that someone would take offence to this - given that violence, to varying extents, is employed in our games). The colourful array of French Revolution characters up for collection makes for an interesting game. Shuffle the action card deck separately to the noble deck. Each deck has a different coloured back to the other and the noble deck has two Guillotine symbols on its back. Deal 5 action cards (the white backs) to each player. Leave the two decks as draw piles. These cards are action cards - for example the humorous "Fled to England" card lets one of the nobles leave the line (for example, if you are about to collect a card that makes you lose points, like the Martyr card, you can discard it from the front of the line). "Let Them Eat Cake" is obviously a reference to Marie Antoinette - it lets you move her to the front of the line. Noble cards are as above. The number of points they are worth is shown in the bottom right hand corner. The general idea is that unpopular figures in the eyes of the public are worth more points. If I played the Public Demand card, this would allow me to bring any noble to the front of the line. ..and then I take her for five points! It really is up to you but the game recommends you play "3 days" with a day being completed where all 12 nobles in the line are executed. When you start the next day you draw a new line of 12 nobles. Whoever has the highest score at the end of the allocated days wins.